The Beach Bodies were built!! 22 participants this past June got together to walk, run, bike, kayak, plank, push-up, squat, jack, lunge, climb, and burpee their way to better fitness. They also drank water; filled up on healthy fats, protein-filled foods, and lots of vegetables; avoided added sugar and artificial sweeteners; built mindfulness; got enough sleep; and completed food diaries. The results were incredible! Total Balance Fitness Challenge New Best Records were made! Julie Kaupa lost 1.1% body fat! Ali Midura lost 5 pounds! Fran Lesicko lost 1.1% body fat, gained 4.6 pounds of muscle, and lost 1.25”! 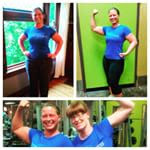 Sarah Zwier lost 1% body fat, lost 4.2 pounds, and lost FOUR INCHES! Amanda Soczynski lost 1% body fat, lost 4.6 pounds, and lost 4.75 INCHES! Margaret Hilger lost 1.2% body fat, lost 8.6 POUNDS, and lost 2.75”! And our Biggest Loser Johni Baxter lost 1% body fat, 12.2 pounds, and 9.75” !! Wowee! She beat previous Biggest Loser Lauren Wanna who lost 11 pounds in Lose Your Love Handles, February 2013 and now hold the record for the BIGGEST Biggest Loser ! A huge WAY TO GO to all our competitors! !